July 15, 2018 July 15, 2018 - by benign0 - 9 Comments. Again, like the federalism “issue”, political “analysts” and their dogs have recently been issuing their two cents on the whats and what nots of the state of the Philippine Nation. This is of course the gathering din of two-bit chatter in the lead up to the State of the Nation Address (SONA) to be delivered by Philippine President Rodrigo Duterte on the 23rd of July. As expected, this all-too-familiar quibbling on “practical details” surrounding this trending “issue”, whilst comforting to those whose comfort zones don’t extend beyond the small details, misses the bigger point. The bigger point is that, in the bigger scheme of things, the Philippines really hasn’t changed much. 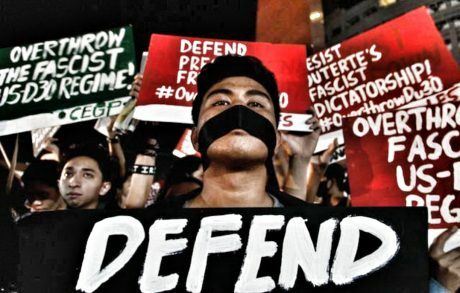 Concluding that the state of the Philippines has “deteriorated” in the last two years of Duterte’s presidency is like making an issue about a 100-foot chunk of ice breaking off the top of an iceberg. The Philippines’ fundamental character has not really changed across the dozen-odd presidencies since being granted “independence” by the United States in 1946. And so, the folly in asserting that the Philippines had changed over the last two years is no different to all the hype around “change” that supposedly happened, say, after the 1986 EDSA “revolution”. It’s all just smoke and mirrors. Regarded over the scope of everything relevant to a proper and sound analysis (the proverbial whole iceberg including its submerged part) and over timescales covering decades, one will find that there is nothing about the character nor the future prospects of the Philippines that has really changed significantly. The Philippines remains a Third World country at its core. It is a society of superstitious and religious people whose idea of “thinking” is praying rather than, well, thinking in the real sense of the word. Its people’s loyalties to political and showbiz personalities trump any semblance of consistent adherence to a coherent set of principles and ideas. Despite modern technology permeating many of its people’s ways of life, no evidence of a tradition of scientific and technical achievement seems to be taking root. Most important of all, Philippine society overall fails to exhibit a collective wherewithal to be self-reliant and accountable for its own future prosperity. Regarded from this perspective, it is easy to see that comparing the Duterte government to the government of his predecessor, former President Benigno Simeon ‘BS’ Aquino III is pointless. For that matter, comparing all Filipino presidents since 1946 yields nil insight of any real consequence. The foundation for a truly prosperous, just, modern, and independent society, quite simply, remains absent in the Philippines. The ebb and flow of inflation, the jagged trends of currency exchange rates, the fluctuations in remittances of the Philippines’ army of overseas workers, and the petty political posturing of the who or what are of no great consequence to what really matters over the long term: a solid fixed capital base of infrastructure and private sector assets that supports sustained robust labour productivity gains, a workforce of industrious, disciplined, and innovative professionals, and a culture and ethic of curiousity and conquest tempered by a habitual critical regard for any issues and challenges to confront. An evaluation of the reform agenda (if any such exists) or a retrospective stocktake of the achievements of any president or whatever politician should be measured in those terms. Only framed in those terms will a SONA be anything of real significance to the Filipino. The way I see it, most of the problems stem from an entrenched oligarchy which rigidly enforces their monopoly on power and industry. Another issue is a widespread lack of accepting personal responsibility, and a failure to hold the right people accountable. The latter can change with the right leadership. But it will take something drastic to change the former. Though it is not out of the question. As the world grows smaller, the potential opportunities the Philippines offer will grow harder to ignore. The size and industriousness of the Filipino OFW workforce are testament that the people already exceed their opportunities. The leaders Filipinos need are those who are courageous enough to confront cultural issues that involve taking positions that are not necessarily popular. They should also be able to step back from ingrained traditional thinking and explore counterintuitive (to the Filipino) alternatives whilst applying an outsiders’ perspective. if the people still cannot feel the changes in the present administration, then they’re expecting more what they felt during the marcos era. I hope the President would consider overhauling our system of leadership and make it appealing (once again) to those who have the potential to join government. The problem is not just the voters choosing the wrong ones, it’s also the lack of willing and qualified candidates. Shouldn’t our leaders be assessed for competence and integrity prior to the issue of discrimination? Also, the gov’t isn’t doing well when it’s almost always on the defensive mode, as if retreating until it’s cornered to inutility. It can be overwhelming when the President is practically on his own. An oppositionist “VP” makes it even worse. I agree that the gov’t should be responsive and within reach.. I’ve come across many Filipinos who work hard and put much care even in the humblest positions. That’s a spark of hope for me. We put most of our time in politics. Politics is the past time of Filipinos. The Filipino politicians, who are mostly corrupt, are glad on this situation. They are the “point of interests” of most people. Once they are in power, they scam the people who voted fore them. Government is not the problem here. It is the attitude of most Filipino people. Politics is the road to riches. Scamming voters work. Being corrupt is an asset. It is the mindsets and cultures that have to be changed. Even if you change the government, I don’t believe that there will be any substantial change. “The more things change, the more they stay the same”, they usually say ! We should be aware of the fact that Filipino existence unfolds in its inner world of family, relatives, friends, and immediate community. There it is, should be at least, whole, and it is there that it is vulnerable, exposed as it is to the exigencies of life in the present, with millions going overseas in the hope to experience materially better conditions, or dwelling in the social media on internet, so forgetting about life in the real world while “feeling stuck in the comfort zone of likes and semi-anonymous opinion.” As a result, if there is such a thing as damaged culture, it is the damage of the inner world caused by the conditions of present-day life. I do not know whether there is such connection. Love of country is a many-headed animal. Everybody is emotionally attached to Heimat, to place and community of birth, which, for for most people, is rather tangible, close to home, but may expand to include the personally unknown other, resulting in the idea of ‘imagined community’ that may enlarge to ‘nation’, and, in a religious sense, to fellowman or mankind. Responsible citizenship is a different creature, which brought the distinction of Gemeinschaft (community) and Gesellschaft (society) to mind that, by their very nature, call forth different codes of conduct. Whereas communal life demands a civil culture of politeness, consideration, cooperation, life with multitudes of unknown others should result in the civic culture of city and state, in said ‘responsible citizenship’ in which public affairs have become personal concerns. This demand stands in obvious contrast to the EJ or makalusot way of life characteristic of current Pinoy existence. This style of going about in the wider environment even infringes upon ordinary civility, for example the barrage of compulsive hubbub, heavy with mind-numbing beat or moronic drone, inconsiderate karaoke fun, the littering of public space, the amplified insult to musica sparked off by one’s neighbors, and parking or stopping one’s conveyance in explicitly forbidden places, such as unsurveyable curves and other-endangering spots, many a time right in view of a police outpost. What comes to mind, is the frequency of commenting on ‘impunity’, run-away ‘individualism’ or the each-and-everybody for him/herself, prevailing short-time perspectives combined with the ease of changing ‘loyalties’—if you can’t lick them, join them—and we find ourselves in a perennially fission-prone society. Such comments and observations about life beyond one’s inner circle make the desire for responsible citizenship, civic culture, or Bürgerlichkeit (‘burgherhood’) no more than a fata morgana. Harking back to the idea of ‘damaged culture’, one might as well talk about a ‘failed society’, which would imply that there ever was a wholesome, coherent way of living together. There NEVER was; at best we witness the stunted growth of a people at drift that cluster around local strongmen or caciques, which implies that bonds are essentially personal / emotional, or build on materialistic motives. Modernly, there is no pride or identity in being part of a so-called ‘imagined community’ that would comprise a Philippine nation-state, and so, in the absence of these, Gavina’s ‘responsible citizenship’ is not in sight. Gavina, Jason DC. 2017. “An emoji for Ninoy”, PDI 8/31/17: A13. Mulder, Niels. 2016. Life in the Philippines; Contextual Essays on Filipino Being. Quezon City: University of the Philippines Press: 175-89. Ocampo, Ambeth R. 2017. “Painfully relevant in the 21st century”, PDI 6/28/17: A17. Constant negative interference really damages a culture. Disruption has caused a discontinuity in cultural memory and doesn’t allow them to self-correct. The Filipino concept of “malasakit” implies a multitude of potential.. for a collective selfhood, and individual strength if realized. @niels mulder: What I conclude from what you wrote above, in short, the Philippines remains stuck in a mindset framed by Heimat or that inner world that does not go beyond family and immediate community. Modern nation/city-level society and those specially functioning under democratic governance require that Filipinos think beyond that frame but are, unfortunately, intellectually unequipped to do so. The result is what we see today — a perverted democracy and a dysfunctional use of public space. A more recent nuance of the latter affliction (still on dysfunctional use of public space) is only beginning to be understood now after several iterations of democratic exercise since 1986 and in the advent of social media. This can be observed in the quality of the political discourse which remains stagnant and seemingly incapable of evolving. The political discourse in the Philippines remains framed by cult of personality, petty sniping at and quibbling over the minutiae of current events, and fixation on the retrospective rather than an embrace of the prospective among others. This collective behaviour makes sense in the context of the hypothesis that Filipino thought systems have not evolved past the Heimat frame. Overall, this points to the sad reality, that Filipinos can practice and participate in “democracy” at a transactional level but will consistently fail to appreciate the broader context that this practice and participation should be framed by. The results are what we see today. There is more that unites us than divides us. So make it a point to talk with someone who is different from you. You may find that you have more in common than you think.